1. Counter-puncher Carlsen: Peter Heine Nielsen shows how, cool as ice, the world champion seized his chance against Caruana in the IoM. 2. Calculate correctly: test your calculation of variations with Oliver Reeh in his interactive tactics video! 3. The improved Grand Prix Attack: let Simon Williams enthuse you for 2.Be2 against the Sicilian. 5. Drum roll with a long echo: Max Illingworth sums up what Grischuk's 6...Bc5 has set in motion in the theory of the English Opening. 6. What's new in the King's Indian Attack? Let Igor Stohl bring you bang up to date. 8. Attack, attack, attack: let Aronian's second Ashot Nadanian show you how the Armenian notched up his first win in the World Cup final. 9. Doubled is better: find the diversionary motif in Khalifman,A - Ehlvest,J 1-0 from the FIDE training course of Efstratios Grivas. 10. 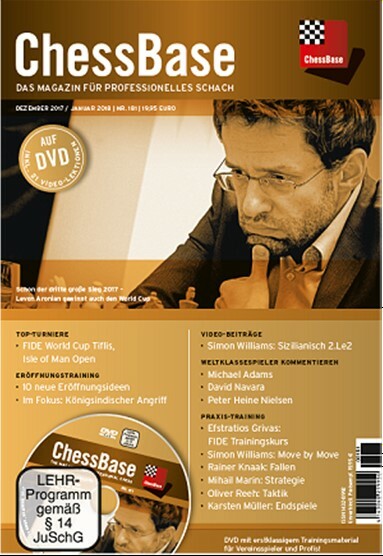 World Cup decider: enjoy one of the most spectacular tiebreaks in Daniel King's video analysis!